Thirteen new polls today and since ARG is going to release 30 new polls today I will have even more tomorrow. Before getting into today's data, a small technical note. Since there are so many overlapping polls now, something that didn't happen before, questions like should a Sept. 14-16 poll replace a Sept. 12-18 poll are starting to occur. To be consistent, I have formulated a set of rules described below. As a consequence of these rules, five of the new Mason-Dixon polls are not being included (MI, MO, OR, PA, and WI), because they do not meet the new criteria for replacing an existing poll. Only one of these changes who is ahead (WI) but since ARG is releasing a new poll for Wisconsin today, having one poll be in dispute for one day is a small price to pay for a clear and consistent set of rules about which poll is most recent. 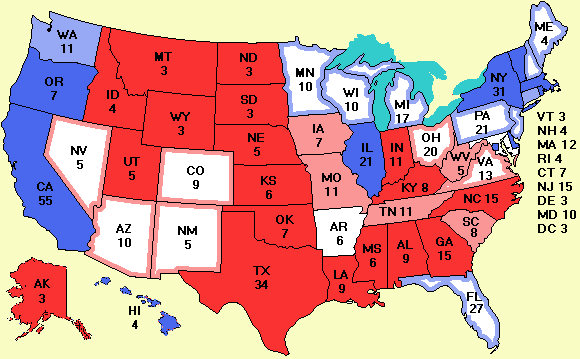 The big news today is that Kerry is once again ahead in the electoral college by dint of his edging ahead in Florida (49% to 48%) and New Jersey (47% to 43% among RVs). However, these gains were partially offset by loses in Iowa and New Mexico. In Iowa, a new Gallup poll puts Bush ahead 48% to 43%. In New Mexico. a new Mason-Dixon poll taken Sep. 15-16 puts Bush ahead 47% to 43%, compared to Zogby's Sept. 13-17 poll showing a Kerry lead of 54% to 42%. That is a 15% switch in a couple of days, far outside the MoE. Clearly there are serious methodological issues here. These issues far overshadow the MoE, which is why I don't include the MoE in the spreadsheets. If one pollster is mostly sampling Democrats and another is mostly sampling Republicans, the MoE doesn't mean a lot. A new Senate poll in Colorado puts Salazar ahead of Coors there again. In another poll in Colorado, when people were asked to free associate, when the interviewer said "Coors" most people said "beer." When the interviewer said "Salazar" most people said "attorney general," a good sign for Ken Salazar since state attorneys general are not usually well known (quick-name your state attorney general). In voting news, the Pentagon has restricted access to the website overseas voters, both military and civilian, can use for registering to vote, citing attempts to hack it. The story was first reported by the International Herald Tribune. Is the Pentagon, with its billions of dollars, incapable of building a simple website that is difficult to break into? And is the answer to attempted break-ins to disenfranchise overseas voters, including the servicemen and women who are defending this country with their lives? Is this how we support the troops? By taking away their right to vote? Microsoft and other companies are attacked all the time, and their reaction is to put up strong defenses. Surely the Pentagon is capable of doing what the computer industry does every day? I recently talked to a knowledgeable source who has been in Iraq for a long time and his impression is that the reservists and national guardsmen there are quite unhappy, especially about having their tours of duty extended. It is not unthinkable this unhappiness might be expressed if they were allowed to vote. Fortunately, overseas voters, including members of the armed forces, who haven't registered yet can fill in the necessary registration forms online via overseasvote2004.com and then print them. Instructions for sending the printed forms to the U.S. are given on the Americans abroad page. But time is running out. Political analyst and author Ruy Teixeira has written an interesting article about how the polls are normalized. Professor David Price also has a good article on polling and its problems. Another interesting election article is one in the LA Times by law professor Richard L. Hasen on the Colorado referendum. If you are not interested in the mechanics of the site, you can stop reading today. At the start of the campaign season, polls were few and far between and nearly all took three days. It was very clear then which poll was more recent since they were usually weeks apart. Now there is a plethora of polls of varying lengths so I have to define "most recent" a lot more carefully to avoid making subjective judgements about which polls to use. Here are the rules. They are are designed to be reasonable and also to not require any changes to the thousands of lines of code used to produce the 60 or so web pages, charts, graphs, etc. that are automatically generated from the spreadsheet data every day. 1. Only replace a poll if the new one is more recent. 2. Shorter polling periods are better than longer ones. 3. Polls can only be averaged with other polls of the same length. 4. Dates cannot be averaged. 5. It is undesirable to have the spreadsheet date go backwards. 1. If two or more new polls have the same polling period, and are more recent, they are averaged and go in. 2. If two or more new polls have the same middle date but different lengths, shorter beats longer. 3. If a new poll has the same middle date and length as the current one it is averaged in, otherwise it is discarded. The purpose of rule 3 is to prevent having to average dates, which will be confusing because people will look for a poll ending on the date on the spreadsheet and there won't be one. Thus averaging comparable poll values for the same time period is OK but averaging dates is not OK. Yes, I realize that With a bit of effort, the rule set could be made even more complicated and ultimately resemble the internal revenue code, but I would prefer not to try. As an example of how rule 3 works, yesterday's poll for Ohio was Zogby's Sept. 13-17 poll. The new Mason-Dixon poll was taken Sept 14-16, the new Univ. of Cincinnati poll was taken Sept. 12-18, and the new Rasmussen poll was also taken Sept. 12-18. All four of these center around Sept. 15. The three new ones are therefore discarded because they would require averaging the dates with the current one. Tiebreakers always have a certain amount of arbitrariness in them, and in this case ties with different polling periods are broken in favor of the first one published. Fortunately, in this case it doesn't matter because the same candidate (Bush) is ahead in all of them. Given the tremendous number of polls coming in now, no poll in a battleground state is likely to last more than a few days anyway, the occasional discarded poll will hardly matter. As example 2, the current Zogby poll for New Mexico was taken Sept. 13-17. The new Mason-Dixon poll was taken Sept. 15-16, so it is half a day newer and replaces Zogby. In contrast, the Mason-Dixon poll for Missouri, taken Sept. 14-16 is discarded because it is not newer than the Zogby Sept. 13-17 poll and date averaging is not allowed. The rules have been designed to avoid replacing something by something that is not newer. While this may seem like splitting hairs, splitting hairs is tough work, but somebody has to do it. Ads have now been placed on the websites of four universities in Ohio, three in Pennsylvania, and one in Florida. See the donations page for links. More are in the pipeline. Not all college papers take ads, and prices vary considerably. Again, thank you to those people whose donations have made these ads possible.